I bought this hair mask yesterday(correction:Sunday,8th September..this was a a post in draft mode :P) that looked a bit weird from the outside because of its pearlescent texture(which you can see from the clear packaging) and the fact that it's a treatment wax which made me confused.Isn't wax used to style your hair and not for a treatment? But because I went to Watson's with the boyfriend's little sister Qeema,who's friend bought the Beer mask and it worked great on both of their hairs,I decided to buy one of the mask for myself. I got the milk protein mask because I like buying hair masks that are for damaged hair although mine is far from being damaged,because I believe that it gives it a bit more moisture.That's just my theory though! Certain days I'm not that confident about my body or skin but my hair is a different thing because it's almost never in a bad condition.Plus it doesn't need expensive hair products to look good and I'm one of those girls who rarely go to the salon for hair treatments. I do hair treatment when I've to recolor my hair because they add treatment to it and I only go to the salon for regular trimming. 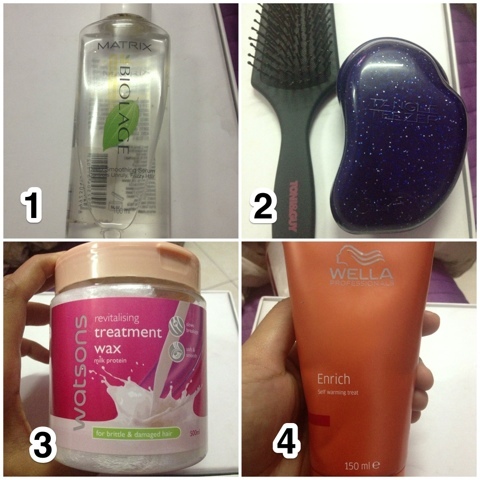 So let's reveal my latest or not-so-latest addition to my haircare regime.You can read my previous old post on my haircare products.I still use the same brand from Clairol Herbal Essences(long term relationship's shampoo & mask) and the same hairdryer. I found this serum at a store near Sunway Giza.There's a haircare products store that's the same row as Cat's Whiskers.I love how I only need a tiny bit of the serum for my hair. I bought the paddle brush at the same store that I got my hair serum.The Tangle Teezer is great when your hair is wet and also easy to carry in your handbag. This is the hair treatment that I was talking about.It's the cheapest hair mask that I've bought as it was only rm10.90!Can you believe it? ?I actually paid only rm2 for it because I redeemed my Watson's points.This not a sponsored post by the way...I've been Watson's member for a very long time.This hair mask works well on my hair.For that price,it's definitely a good buy! I got this hair mask in a sample sachet when I subscribed to one of those beauty boxes(I can't remember which).I bought the full size bottle at a hair care products store in SACC.I use this only 1-2 times in a month.The moment you put it on your head,it'll warmed up instantly.Very cool and scary if you of the chemicals in it.